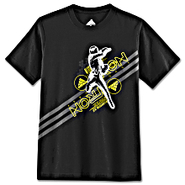 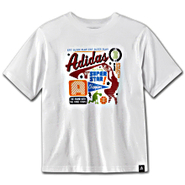 Adidas - The adidas Tron 3D CLU Tee shirt features a sweet 3D CLU graphic for a look that's ready to dominate the Grid. 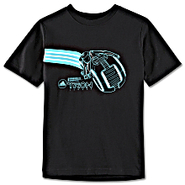 Made in a comfortable cotton build this tee comes equipped with 3D glasses to give you the full Tron effect. 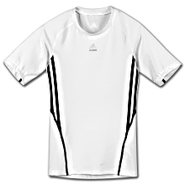 Adidas - It's all about attitude and the adidas Sport Performance Tee shirt gives him a winning one. 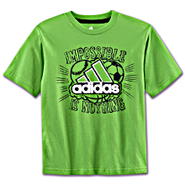 This cotton t-shirt features a big adidas Performance logo on front surrounded by three balls and the motto Impossible is Nothing. 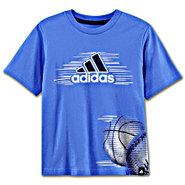 Adidas - Ready to play anytime he is the adidas Sport Collage Tee shirt is made especially for boys. 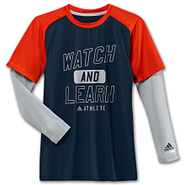 This fun cotton t-shirt is emblazoned with a colorful mix of sporty shapes and pithy words sure to resonate with any young athlete. 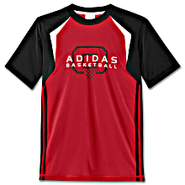 Adidas - Every day is a chance to be better in the adidas Training Camp Tee shirt. 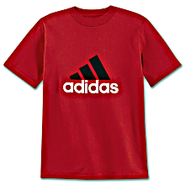 This comfortable t-shirt is cotton-soft and features a fun sport graphic on front and an interesting use of the 3-Stripes on back. 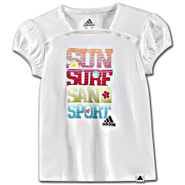 Adidas - Recalling playful days at the beach the adidas Sun Surf Sport Tee shirt is a cute and colorful choice for brightening up any girl's wardrobe. 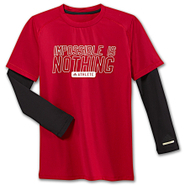 Puff sleeves and a glittery front graphic add an extra touch of girly glam. 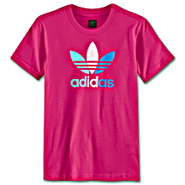 Adidas - Bright and colorful the adidas Summer Sport Tee shirt puts a girly spin on a warm-weather basic. 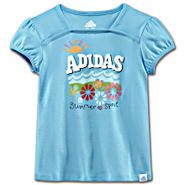 With stylish puff sleeves and a glittery front graphic this sweet and sunny t-shirt can brighten up any day. Adidas - You might not have your own light cycle yet but with the adidas Tron 3D Cycle Tee shirt you can get a little closer. 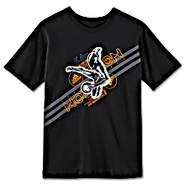 Features a bold glow-in-the-dark 3D cycle graphic that's only a step away from leaving a jet wall in your path. 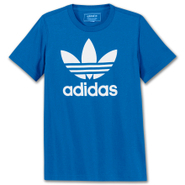 Adidas - Logo Tee Sport is at the center of his life. 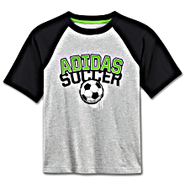 So it might as well be at the center of his shirt too. 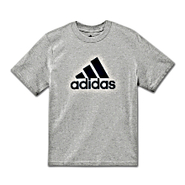 This comfy cotton tee proudly features the adidas name big and bold.